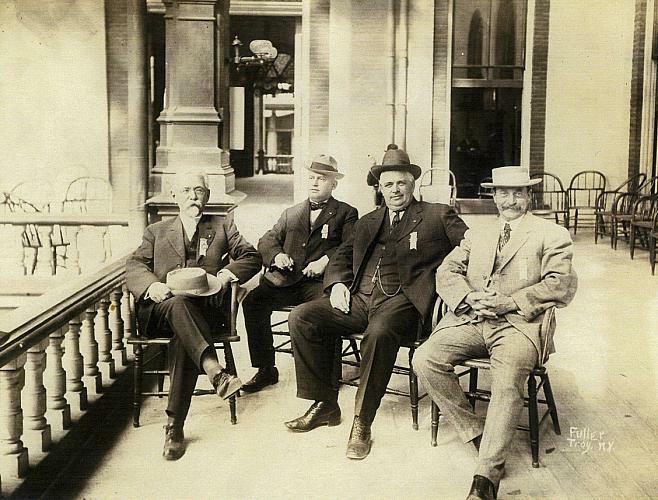 Left to right; Four Masons attending a Masonic gathering, Joseph C. Herkner of Grand Rapids, Edmond S. Rankin of Kalamazoo, Lou B. Winsor of Grand Rapids, and an unknown man, pose for a portrait--probably at a hotel. All wear suits with vests, and three wear hats while Herkner holds his on his lap. Each has a badge on his left lapel. They sit in Windsor style chairs, and more can be seen in the background. Photograph, 5 X 7 in. Title by cataloger. Fuller, the photographer was from Troy, NY. Herkner was a 33 degree Mason and a member of the Grand River Lodge No. 34. Winsor was a member of the Grand Lodge and in 1897 was the Grand Master of Michigan.